Angels’ Heart has been committed to providing an excellent private school education for 30 years and what has remained true is a commitment to each child who attends. A commitment to provide a top-notch education and school experience, small class sizes, and personalized attention. Now, as a school committed to being Future Ready, Angels’ Heart is laying the groundwork for our students to learn in a 21st Century environment, taking advantage of initiatives such as Design Labs, Coding, Robotics and Project-Based Learning. School has separate art gallery with collection of masterpiece art created by extra ordinary students. We take part in inter school art competition evry year and have won many trophies. Apart from class room education, we have introduced various subjects. For this there exists separate audio/visual room with all necessary facilities. Apart from this class we run various short educational movie programs. In this programme we play video related with English literature and other special events like Red Cross Day, And International Environment Day and so on. There are different types of plants, herbs which is important for practical classes for science. It is very important for learning the different types of plants there growth, flowers, different parts. The Canteen provides a fresh, healthy and balanced diet to the students and staff all the times. At the canteen, food is sold on a daily payment basis. The canteen serves variety of cooked food as well as readymade biscuits. Soft drinks, packaged food and bakery items are also available in the canteen. Now a days in modern day’s English language is a must and the medium for communication. Apart from this language we have provided Chinese language class. Chinese language is taught by Chinese teacher from China so that the students could get more ideas and learn the reading and writing skills. Chinese exam is also taken accordingly. The schools make regular arrangement with professional psychologist to help the students with any kind of problems they may encounter during study times. The professional shall be made available on specific time table. School has separate Dance Hall. Students practice to dance by their Dance Teacher. Extra activity is a must in school premises. This keeps the students confident and extrovert in many sectors. Students are sent in dance competition in various school, cultural programs etc. What we believe is only the knowledge from books is not enough for learning. We believe in practical basis. In which we go through the different places and get ideas, knowledge from it. Likewise, according to the lesson or topic we go through the places and study the cultural heritage and many more. The well managed school hostel provides students residing outside Kathmandu valley with opportunities to study in healthy environment conductive to learning. There is provision for separate hostel for boys and girls students. Every effort is made to ensure that the borders are kept comfortable, clean, healthy and happy. The students follow a fixed time table on days of the week. Study classes are held in the morning and evenings. The time table ensures that all students get opportunities to take part in co-curricular activities. The school infirmary is stocked with all the first aid medicines. It is equipped to handle minor cases. In case of emergency students are referred to nearby hospitals or nursing homes. Our school has a well equipped library to meet the demands of the students interested in reading books and material beyond the curriculum. All curriculums related books are available in the library. There is also provision of reference books related to the subject materials. In addition to the course books, our library is equipped with different stories and other types of books. Our School has essential Math Lab which can inspire by practical and demonstration itself in the lab. With this way all children truly learn Mathematics. They must learn to view math as a sense making endeavor. Teachers must provide appropriately problematic tasks; have a culture in which ideas and methods are valued and mistakes are viewed as learning sites after encourage students to use tools with intention and purpose. School has separate Music Hall. Students can practice to sing by their music teacher. Music is life. Music can touch our inner soul. It has a power of healing, refresh our mind and help to concentrate in our daily activities. The place where students love to play and explore their activity. The ground is efficient for basketball, football, table tennis, etc. There is pre-primary ground like slide, see-saw, swing and many more. We have Physics, Chemistry, Biology Labs for practical and research work. Science and technology is the demand of the modern world. Science is becoming more and more popular these days. In order to enable our students to adapt to the changing scenarios around the world we give due importance to all the subjects including science. To provide the students with practice based learning environment related to science education, our school has a well equipped science laboratory. We have National level Swimming Pool. A wide range of in house and outdoor extra-curricular activities are conducted by the school as demanded by education system and curriculum and as per interest of the students and parents. This is extra activity which keeps healthy and fresh mind. This is exercise of body and brain. The school has buses for the different routes, covering the Kathmandu valley. This facility is optional. The school bus, Micro Van and vans covering the Kathmandu valley. This service is optional for the students and the students are charged extra for this facility. Buses ply on definite routes. Angels’ Heart is a very special school. It is not only a school, a place for learning, but it is also a home in many ways. The administration, teachers, parents and students all have a connection and a bond that unite us. The students use their intellects, talents and gifts to stretch themselves and become the best they can be. The part I love the most about Angels’ Heart is seeing children smile when they go home and hearing them say “Today was an awesome day!” or “I love this school!” Without being prompted to say it. Me, Myself, I feel like I’ve grown more in the first quarter of the year than I did in my college. Everyone is willing to get their hands dirty to make you a better teacher. I am not afraid to try to new things at Angels’ Heart because I know there is a family to fall back on and learn from. With being a Angels’ Heart teacher for only a year, I have been so amazed and impressed with the organization! The organization is professional, committed to growth and learning, and treats its employees with the utmost respect and enthusiasm. I am trying to honour their great work with my every student. A school is a temple of learning and a training ground for future citizens. 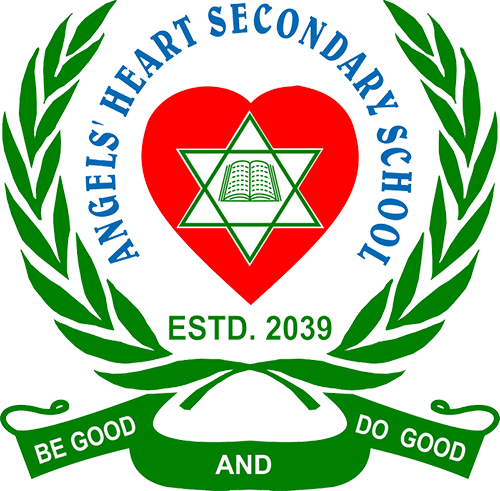 Angels’ Heart Secondary School is one of the well-known schools in our community. It’s my great pride and happiness to be here in Angels’ Heart Secondary School. The relation between the teachers and the students is harmonious and the teachers are very helpful to the students. The students also respect the teachers from the bottom of heart. Our school is playing a significant role shaping the future personality of a child. Our school is trying to be a centre for learning good habits at tender age which has an everlasting impact. The study norms of my school are very creative and innovative which help us in understanding tough matters very easily. Our teachers teach us very sincerely and tell us everything practically. Our school doesn’t only focus in study. Our school encourages students to take part in co-circular activities. Our school time is very interesting and enjoyable as we do lots of creative and practical works daily. Our class teacher also encourages us in storytelling, poem recitation, helps us to learn the quotes of great people too which helps building our self-confidence. I think my school is one of the best schools. I am proud of to be in Angels’ Heart Secondary School. It’s my great honor and pride to be student of Angels’ Heart Where I am free to pursue my dream. It is a place where we are learned to open our wings to fly high. I am fully confident to develop my career from this school and work to develop my nation. Angels’ Heart has been helping me to dream higher than the clouds and achieve it. Thank you Angels’ Heart for making me braves enough to face the competitive world. If you have a suggestion or any feedback for us, we’d love to hear it. Copyright © 2019 Angels' Heart. All Rights Reserved.